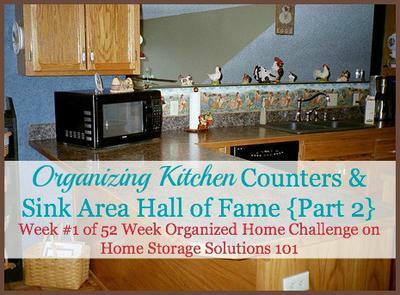 Here's the second part of the hall of fame for the Organizing Kitchen Challenge, which focuses specifically on clearing counters and the kitchen sink. Just like with the first batch of Hall of Famers I'm so proud of these ladies and all they've accomplished during the past week. 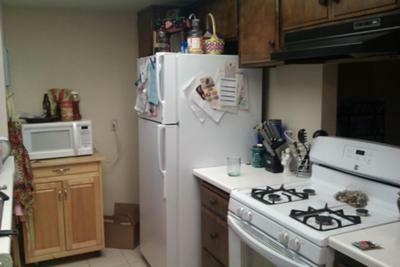 If these before and after pictures and descriptions of what was done to organize their kitchens inspires you to action, you can check out the full Kitchen Organization Challenge here. It is the first week of the 52 Weeks to an Organized Home Challenge (please join if you haven't already). You can also be featured in the hall of fame if you've done this challenge, either during the week it ran (or at any other time). All you have to do is send me in some pictures, a description of what you did (or a link to your blog if you've shown your accomplishments there -- plus give me permission to use some of your photos). Just provide your submissions to the Creative Storage Solutions and Home Organization Hall of Fame! Crystal's showed her results when working on this challenge. 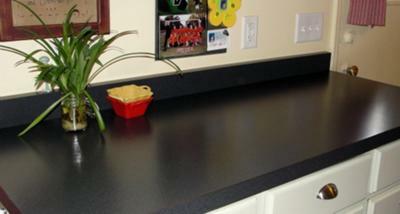 She explained that she really focused on the functions of her kitchen. Here are some of them she mentioned, including food storage, food preparation, homework area, bill area, coupon area, art display area and craft area. Those kinds of functions all sound pretty familiar to me, don't they to you? I know we do all those things in our kitchen from time to time. I love how she decided she needed to keep doing all those things in her kitchen, but to do it more intentionally. 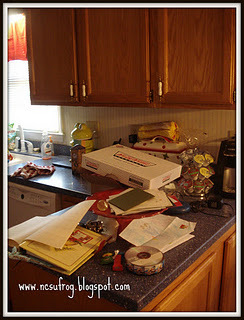 I especially love how she used materials she already had in her home, and created a paper sorting and containing center which she placed in her kitchen. 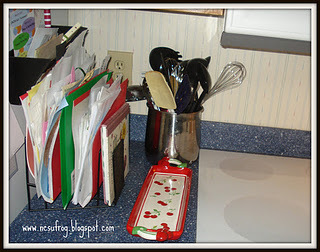 Now, instead of paper going directly onto the counter it goes into the folder, keeping things organized and the counters clear of paper clutter. Great job Crystal! 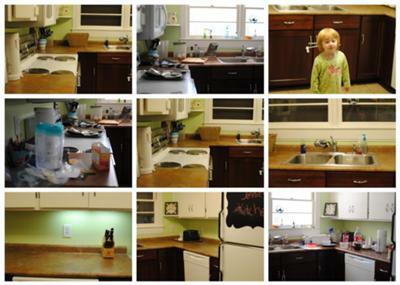 Jennie created a beautiful collage of her kitchen organization project for the week, and put it on the site's Facebook wall. 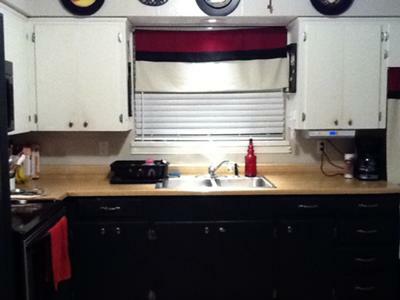 Here are my before and afters in my kitchen. I won't say what my dining room table looks like. 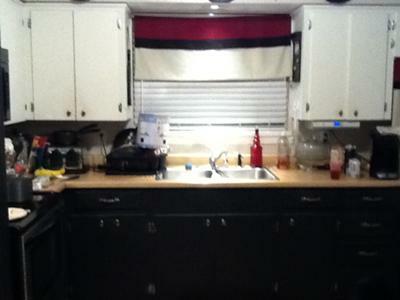 LOL I think next weeks challenge is really to do the new project and keep the kitchen clean. My 3 year old said she didn't like it because all the stuff was gone. This may take the cake Jennie for the most creative photos I've received! Plus, I love seeing the progress you made. I'm sure your child will see the beauty in the clear flat spaces at some point, like when it benefits her! I think she did....when I made tacos for dinner for my hubby and I, she said she wanted waffles...it was fairly easy to do both of them at once. AFTER! So clean! So much more space! 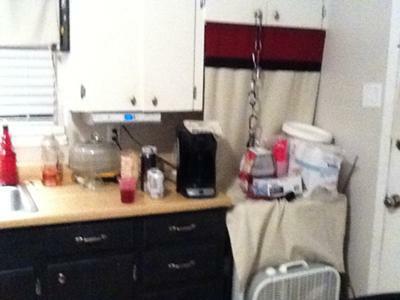 Courtney also participated in the Organizing Kitchen Challenge, and here's what she got accomplished. I got rid of non-working appliances, cleared off the top of my fridge, moved my pasta canisters to the top of the microwave to have more counter space (and actually put pasta in them! ), hung some art, moved some art, got a decorative basket to house my out-going mail and bills instead of the old pile system I was using, scoured the sinks, and wiped the cupboards. I feel soooo much better!!!! Thank you!!! You did a wonderful job Courtney. You did quite a bit this week, and I really like how you're thinking about the functions of your kitchen and making your uses for it intentional. Now that you've got a nice decorative basket, you've gotten through part of the battle. Now, the hard "maintaining" part of the challenge begins though, to create and use a system to deal with the stuff in this basket on a frequent basis so it serves its intended purpose and doesn't just become a new junk magnet. Please keep me updated on how it's going in the future, both with maintaining this area, and for additional challenges. By the way, I love your little owls! How cute! Week #1 kitchen counters and table.....just started today, have a small space but I plan on making more adjustments. Thanks so much for sharing this pic. It's truly worthy of the hall of fame. You should be proud! Thank you. 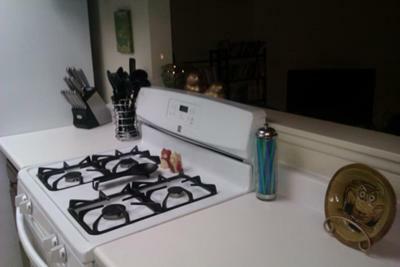 I removed the cooking utensils from the counter top and put them on the wall. I rearranged some of the cabinets to make space for the items that go in the cabinets. 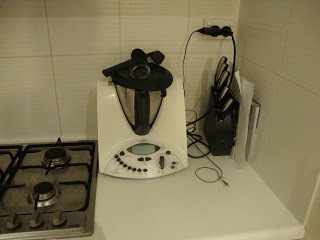 I got rid of duplicate or not working items like a spare blender and juicer. I followed your suggestion and thought about what functions I wanted my kitchen for, then I added a kitchen control center with a weekly menu space, shopping list space and a monthly calendar to write down important family dates/appointments. My next item to remove is the paper towels. I've decided to nail the paper towel dispenser under one of the kitchen cabinets. I just need to find a space for the baby's bottles so they can stay off the counter. Thank you again for your ideas on this challenge. by Becca @ 2012 - The Year of Challenges! 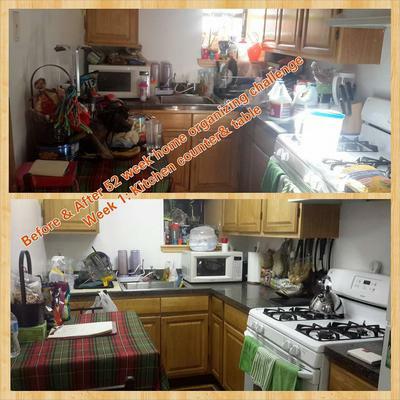 Becca shared her blog post about the Organizing Kitchen Challenge on the site's Facebook wall, and she's doing a great job so far. Becca's blog is called 2012 - The Year of Challenges, where she showed her accomplishments for this week. She showed her amazing clear counters (an after picture), and at the same time you can see a great idea for storing her kids' book bags as they come in the door. 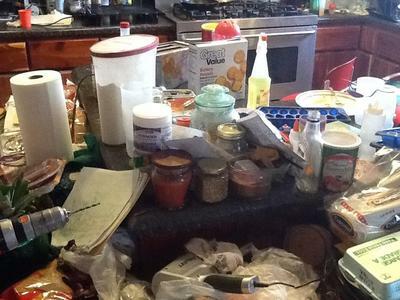 Like so many of us, when our family members head into the kitchen they seem to just drop stuff, and the area becomes a dumping ground for everything that comes in the door. The storage cubbies that the kids can use keep their bags held neatly off the floor or counters, but still within easy reach and their central location most likely makes it easier for kids to actually put stuff where it is supposed to go. Love it Becca! I got this reader response to Bec's pictures. She said, "seriously the best idea for the other side of a peninsula. We have no room for a mudroom/entry way unless we start tearing apart our kitchen. I am so going to do this! Inspiration! got to love it!" 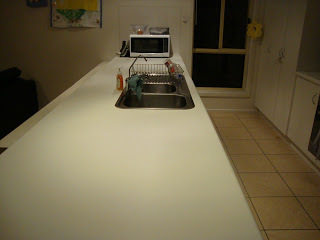 My Counters Went From "How Embarrassing" To "Not Too Shabby"! Melissa is one of the hall of famers in the Organizing Kitchen Challenge. 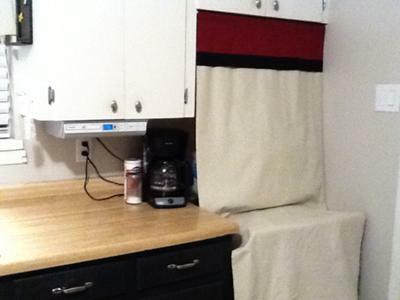 Thanks for your challenge...it motivated me to find homes for all the clutter and chaos that settled in my tiny kitchen. Thanks so much for sharing Melissa. It looks like you made lots of good progress, and will have much more room to work and cook dinner from now on. I also hope that it makes you feel proud of your accomplishments, since you should. Great job. Deck over the bar. Over the holidays it became a catch all for everything on the house was time to get it cleaned up! Wow, what a difference Becky! Great job. 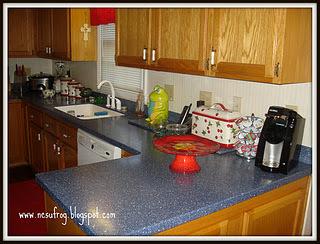 This challenge was fairly easy because I don't keep much on my counter tops to begin with and I keep the sink pretty clear of dishes. I posted before and after pictures on my blog and wrote about it. Now when we have to go through the cupboards and closets, that will be a different story! I tend to hide all the mess. I'm really looking forward to more challenges. 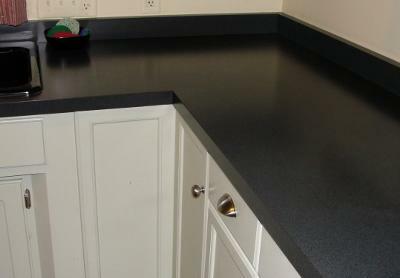 We have one side counter top near the door that tends to collect items, but I do try to clear it daily, if possible. I go through mail as I bring it in and shred and recycle any junk and put bills in one spot in the office. Mostly what accumulates is stuff from school and things we have to get done that week. We might have 1 smaller pile on that counter but it's not used for cooking so it works. 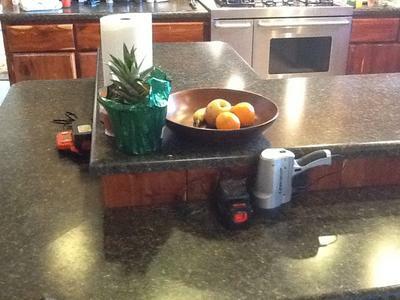 We also keep a basket in an unused corner of the the counter top where we put our keys, phones and chargers. 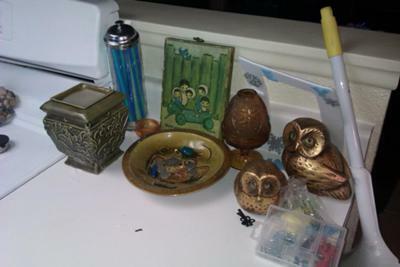 I think these are all great ideas and suggestions Dawn, because you are showing how you use routines and systems to keep the clutter from accumulating, and also how you purposefully place containers in areas where stuff does accumulate so it becomes intentional, instead of just junk piles. Great ideas! Do You Want To Be Included In The Organizing Kitchen Challenge Hall Of Fame? 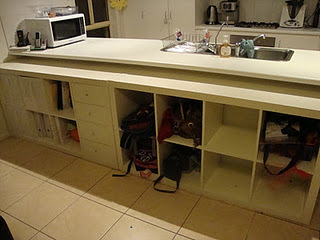 This is the second part of the Organizing Kitchen Challenge Hall of Fame, but I've got more posts to share! You can see the third hall of fame for week #1 here. If you'd like to get featured for your efforts on this challenge, or for any of the other challenges in the 52 Week Organized Home Challenge, please submit your pictures, stories, and accomplishments. All you have to do is click this link to enter the Creative Storage Solutions and Home Organization Hall of Fame, write your story, enter your pictures, or share your blog post and I'll make sure you're included! 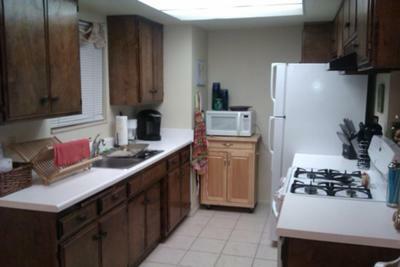 Some of the before pictures look so much better than how my kitchen looks. Now I don't feel so bad. Thanks for posting!